Railpictures.ca - A.W.Mooney Photo: This cute little place was built around 1882 when the Grand Trunk took over the Northern Railway of Canada. The Stationmasters living quarters and the waiting rooms were added in 1889. Two waiting rooms because back then there were separate rooms for men and women! Interesting too is this is the last station left in Ontario with an original turret. The station closed in 1960, served as a cottage for awhile and then in 1968 was bought with a restaurant in mind. That venture, a quaint place called, The Depot, as shown, served up great steaks and did a fair business considering when I was there frequently in the 1980s there was no liquor license. Ill health caused the owners to close @1998 and in 2000 the building was repurposed as a museum. In 2016 a library was incorporated as well. Tourist information on the Blue Mountains can be obtained there. Lilacs brought from Scotland by Sir Sanford Fleming flourished in the gardens. It was said they were brought to mask the stink of the outhouses:o) The lilac gardens are now an Ontario landmark. Oh, and the tracks? Pulled up in 1985 and replaced by the Georgian trail pathway. | Railpictures.ca – Canadian Railway Photography – photographie ferroviaire Canadienne. 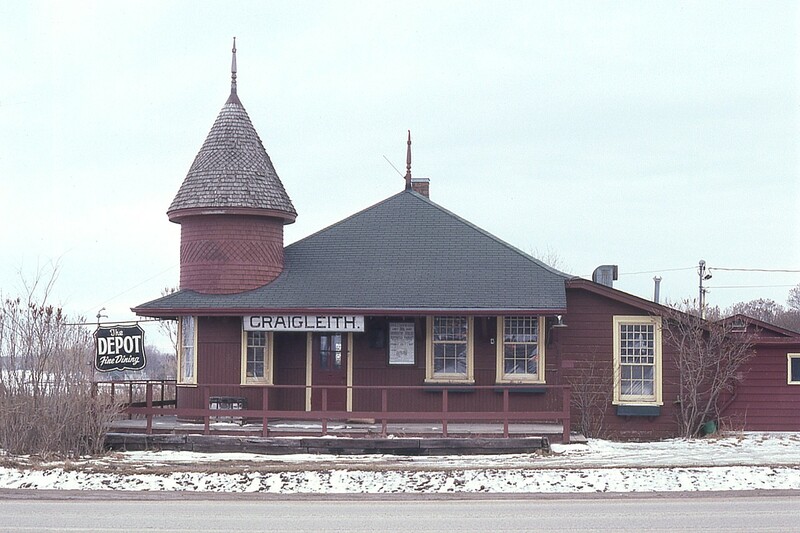 Caption: This cute little place was built around 1882 when the Grand Trunk took over the Northern Railway of Canada. The Stationmasters living quarters and the waiting rooms were added in 1889. Two waiting rooms because back then there were separate rooms for men and women! Interesting too is this is the last station left in Ontario with an original turret. The station closed in 1960, served as a cottage for awhile and then in 1968 was bought with a restaurant in mind. That venture, a quaint place called, The Depot, as shown, served up great steaks and did a fair business considering when I was there frequently in the 1980s there was no liquor license. Ill health caused the owners to close @1998 and in 2000 the building was repurposed as a museum. In 2016 a library was incorporated as well. Tourist information on the Blue Mountains can be obtained there. Lilacs brought from Scotland by Sir Sanford Fleming flourished in the gardens. It was said they were brought to mask the stink of the outhouses:o) The lilac gardens are now an Ontario landmark. Oh, and the tracks? Pulled up in 1985 and replaced by the Georgian trail pathway. Such an attractive station. Passed by it last year. Too bad the South Simcoe Roseau never got the trackage here. I heard a long time ago they tried for it but the trail won out. Thanks Raymond. I remember the railroadiana in there, it really gave a nice feeling to the place. But mostly, I remember it was the only restaurant I had ever eaten at which, on the way out, hold the old screen door so it would not slam and annoy others:o) The cottage/station atmosphere was well maintained. Kenn Knapman whose wife Suyrea was the chef were great people. There was lots of railroadiana displayed. Once they were well established Kenn planned to lay track back down and add some rolling stock for a B&B but could only get permission to have one car which would not have been a viable operation. Out front of the building. To the left in the photo between the station and the Georgian Bay. How handsome. Where were the tracks in relation to this photo?